HubSpot’s featured integrations help deliver a holistic and integrated inbound marketing and sales strategy. 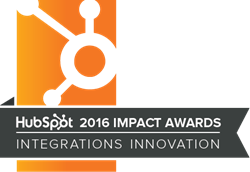 Prism Global Marketing Solutions, a HubSpot Platinum Partner and HubSpot Accredited Trainer based in Phoenix, AZ, is honored to receive the HubSpot Impact Award for Integrations Innovation for Q4 2016. This award recognizes creative and innovative uses of HubSpot, in addition to HubSpot’s featured integration partners, to deliver significant value, quantifiable return on investment, and integrated and strategic marketing campaigns. This is a quarterly award given by HubSpot, and this is the 3rd time Prism Global Marketing Solutions has received this prestigious award in the last 12 months. "Prism Global Marketing Solutions has a great history of using newer HubSpot technology to do amazing client work. This is another chapter of that story. In this post, Prism cuts through industry standards and 'best practices' to deliver the right solution for their client. They do a fantastic job of outlining the finer points of the integration and back up their solution with data. It's an excellent use of a powerful integration and one that other Partners should consider emulating," said Marcus Andrews, Senior Product Marketing Manager, HubSpot. Prism Global Marketing Solutions utilizes many of HubSpot’s featured integrations with their clients based on business needs. The work featured for this award utilized the HubSpot integration, Seventh Sense, an email send time optimization tool based on behavioral analytics that integrates directly with HubSpot. The system analyzes historical email engagement data, builds a detailed profile on each subscriber, and then empowers marketers to automatically send campaigns at personally optimized times. This strategic process to email marketing gives marketers and business owners the ability to utilize email more effectively to get their message in front of their audience at the right time. "We are honored to be included in the prestigious HubSpot Impact Award alongside Prism Global Marketing Solutions. Seventh Sense is committed to driving more value for companies that use HubSpot and email marketing as a critical channel, as demonstrated by Prism Global Marketing Solutions and their clients," said Mike Donnelly, CEO & Co-Founder of Seventh Sense. “We feel that HubSpot’s featured integrations have a significant impact on helping our clients better attract, convert, close and delight their customers. Using HubSpot, along with a strategic and valuable integration partner like Seventh Sense, allows us to deliver additional value at varying levels of the organization, integrating marketing with the holistic goals of the business,” said Rich Meyer, Marketing Director at Prism Global Marketing Solutions. Prism Global Marketing Solutions is a digital marketing agency, HubSpot Platinum Partner and HubSpot Accredited Trainer providing strategic online and inbound marketing consulting and support to organizations around the globe. Prism Global Marketing Solutions understands the constraints of marketing time and budgets, and finds the most unique and effective solutions for their clients to achieve the greatest return on investment from their marketing strategy. Services include: inbound marketing, digital marketing, sales enablement, search engine optimization, lead generation, marketing strategy, marketing automation, social media marketing, and marketing analytics.